Joseph Muscat in Fgura yesterday. 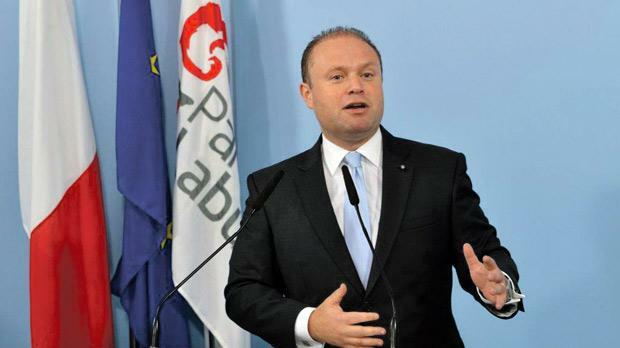 Prime Minister Joseph Muscat called for political responsibility to be shouldered after a video game company into which the Nationalist government had pumped €9 million closed shop. Speaking yesterday at the Fgura party club, Dr Muscat reiterated that the government had to intervene to help workers made redundant by TRC Family Entertainment Ltd.
A due diligence exercise conducted by the previous administration had established that the promoters had a history of unsuccessful business ventures and also suspected that they had something to hide. The report’s conclusion was that the company’s wealth stemmed from criminal activities. Bankruptcy was always a risk in business, he said, but the previous administration had the due diligence report in hand. Last Friday, former finance minister Tonio Fenech said that the company had been formed by three people: Chris Deering, Malta’s special envoy for digital games and the man credited with inventing the Play Station console, Paul Taylor, who was also a big name in the sector, and an unnamed third person. The government opted to carry out the due diligence exercise on the third person because of lack of information about him. Who was the person to sign the $10 million investment? Did they know of the due diligence report or was this kept hidden? The due diligence exercise had not concluded that he had been involved in criminal activities but there was a period in his life about which there was no information, Mr Fenech had said. Referring to Malta’s declining deficit and debt, Dr Muscat said the government was managing this while also slashing electricity and water tariffs, offering free childcare and waiving the stamp duty for first-time buyers. The government had also increased expenditure in education by 38 per cent, in health and the elderly by 40 per cent and in the cultural sector by 30 per cent. About 10,000 people worked in the cultural sector on a part-time or full-time basis. “I am proud to go abroad and bring over more jobs and investment. In the coming weeks, I will be going to Algeria and Dubai to bring more job opportunities to Malta,” he said, adding that it was his duty to attract wealth from abroad. Dr Muscat referred to the criticism he had received when one of his first moves as a Prime Minister was to establish business relations with China. When the Chinese president visited the UK last week, the British had rolled out the red carpet for him and the Chinese had invested in a nuclear power plant in the UK, he said. “We are happy for them because we arrived there before the British as well,”he said. If a new gas power plant was not built, Malta would have to keep depending on more costly heavy fuel oil, making electricity tariffs more expensive and causing more pollution. The Marsa chimney would have to be re-erected to ensure spare capacity, he said.